First, let's talk about me. I'm the guy who hates Call of Duty. I'm the guy who literally wrote the series off a few years back and hasn't played a game in it since. I'm the guy who "hung up" on the Call of Duty. That article, by the way, drove angry Call of Duty fans out of the woodwork on Twitter. I was messaged for literally months after it ran about how I'm terrible at the game. That, folks, is the sign of a passionate fan base. Why, then, was I the one TechnoBuffalo staff member sent out to a preview event? That answer comes two-fold, really. First, the invitation was of the non-transferable variety. That means it was only sent to me, and I couldn't tag another writer in. That's the logistical reason. The moral reason? I'm ready to give this series another shot. As crazy as it sounds, that comes because of Kevin Spacey's involvement with the single player. So, Activision flew me out to San Francisco for the event. They put me up in a hotel, served me a beer (Back in Black from 21st Amendment) and some hors d'oeuvres (the buffalo chicken thing was awesome). I sat in on a 30 minute presentation about what's new in the game, and then I took a seat in front of a monitor and played Advanced Warfare's multiplayer for several hours. Just so we're clear here, Activision made a point to tell me to be honest about the game. I want to get that out of the way alongside our transparency about being sent to this event on their dime. The guideline they sent out with the directions to the event even has a line that reads that they "require…your reviews and posts to be truthful and accurate." As delicious as the beer was, it didn't convince me to love Call of Duty. I'm a skeptic here. Perhaps more skeptical than most. The staff at the site knows it, too. When the event finished and I called Sean (our Editor-in-Chief), he was shocked to hear my thoughts regarding the game's multiplayer. I told him I kinda loved it. The presentation that preceded our hands-on time with the game kicked off with a brand new trailer. That trailer is the same one that premiered for the world today. This is it. After all the boost jumping, sliding and murder went down in the clip, the words "Power – Changes – Everything" flashed on the screen. That phrase, that marketing tagline, is a perfect frame for Advanced Warfare. It applies to the story about guns for hire and their eventual control of society that makes up the main game's plot, sure. But it also nails the premise of what Sledgehammer Games has done to the multiplayer side of the equation. "With 100,000,000 players, what do we need to do to make this game better?" That question was asked during the presentation. The core answer to that question lies with the Exo. The story of Advanced Warfare gives combatants in the game Exoskeletons. Those "Exos," as they were called during the presentation, lend a brand new way to move to Call of Duty. When the gameplay trailer for the title premiered a few months back, the collective hive mind of the Internet concluded that Activision took Call of Duty and made it more like Titanfall. The double-jumping jetpacks sort of make that conclusion an easy one to assume. Unfortunately, it's off by a large margin. 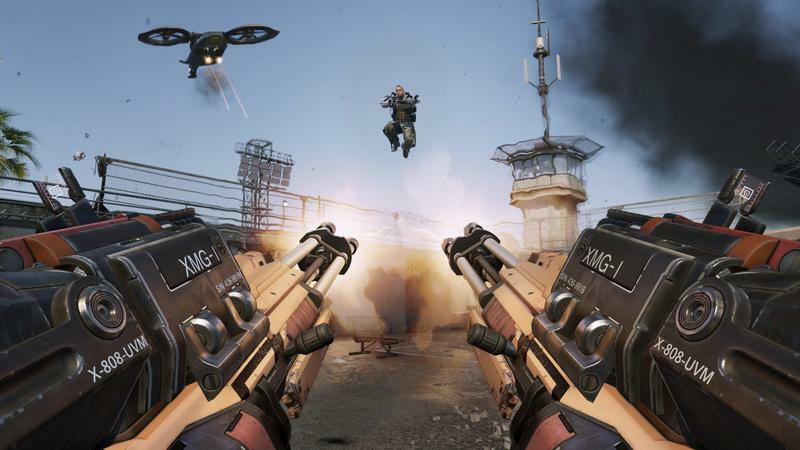 Yes, you can double-jump in Advanced Warfare. They call it "boost jumping." However, it's a much faster double-jump that rockets rather than slowly boosts. You can't run on walls, you can't call in giant titans (though one scorestreak allows for a mech) and there's no killing grunts for points. 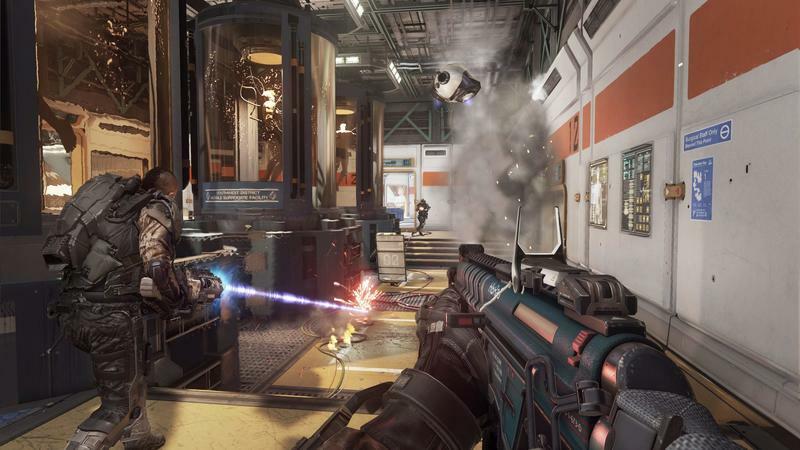 Call of Duty: Advanced Warfare is like Titanfall because you can double-jump. It's also set in the future. And there are guns. Let's leave the connections there. 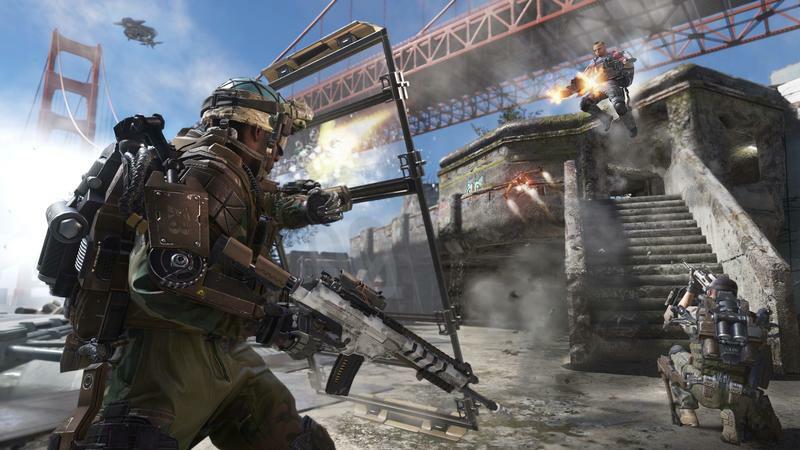 The movement in Advanced Warfare is nothing like Titanfall. In fact, as the "Power Changes Everything" tagline indicates, the movement in this game is almost completely different than it's been in any other Call of Duty. You can boost jump, right. You can also boost slide, you can dash and boost away from gunfire, you can activate a directional boost and dash in mid-air, and you can boost towards the ground for a slam style melee attack. I knew I was playing Call of Duty, but it felt more like an arena shooter mixed with Platinum Games' Vanquish than the follow-up to Ghosts. Every encounter with enemies was faster and more frenetic, and that pacing made the entire round more exciting. I wasn't lulled into sneaking or sitting in a corner in order to pick off opponents during Hardpoint (yes, Hardpoint is back, more on that in a bit). The pace pushed me to blast around each of the four maps we played, and that meant a whole lot of movement and a whole lot of gunplay. I was actually having a lot of fun, in spite of my recent go with Ghosts in an attempt to research leading up to this trip. Remember Pick 10 from Black Ops 2? Advanced Warfare offers Pick 13. Scorestreaks come back with that, and you'll even be able to modify your rewards. Instead of just having a remote turret that costs 600 points to use, you can make it a remote rocket turret for 700 points. That means that my UAV scorestreak reward might play differently than yours thanks to the way that I modified it. There's also something called Co-Op scorestreaks. This is a new offering that I actually didn't physically have a chance to try during my time with Advanced Warfare, but they did show it off on stage. A player will call in a scorestreak reward that another player on their team can join in on. The example they gave here was two gunners on a Warbird rather than one. It's a way for lesser skilled players to see high-end scorestreak rewards. A whole lot can be changed and tweaked with your loadout. You've got your primary weapon and its slots for scopes and grips, of course. The same goes for your optional secondary weapon. Don't want a secondary? Clear it, and you'll get a combat knife. You'll also have your scorestreaks and their add-ons. Then you have perks like faster movement or being invisible on radar. Even further, you'll have Exo Abilities that let you do something unique with the left bumper. That bit is very Halo: Reach, if you ask me. You can activate, basically, armor abilities. A battery powered riot shield might appear, or you'll be faster for a limited time. Those Exo Abilities are temporary, too. Which brings us to Supply Drops, or, as Sledgehammer dubbed them, "Call of Duty loot." Supply Drops are dished out for time played and completing in-game challenges. You might get a unique gun, character customization stuff or new equipment. Some are rare, some are not. Each drop is meant to randomly help all players, not just the amazing ones. That even goes for one-time use stuff. That crazy hard to reach scorestreak reward you've never been able to try because you simply aren't good enough? You could land that in a Supply Drop and use it during a match without hitting the score. Each weapon features 10 customization points. If you add up all of those points on each weapon that will be available at launch, as they told us, you'll get 350 different weapon arrangements. Basic math tells us we can expect 35 weapons, then, when the game releases. When you combine those supply drops with progression unlocks, you'll be able to tweak and personalize your character from the ground up. You'll be able to change gender, gloves, hair, the face, helmets, pants and a slew of other aesthetic bits on your character. As you wait for the next game to load up, you'll be able to cycle through each player and see what they look like, complete with whatever crazy rare gun they have. That virtual lobby is a big change from the list of gamertags we see today. They dropped a rather large stat on us, by the way. If you add up all the character customization, weapon types, unique perks, perk add-ons, Supply Drops and everything else, you get "literally billions of unique player combinations in Advanced Warfare." That's sort of nuts. Wait, There's A Game Mode That Sounds Like Quidditch? Actually, yes, there is a game mode that sounds like quidditch. It's called Uplink, and, according to Sledgehammer, it's been one of the studio's favorites during development. A single ball is dropped onto the map, and your job is to grab it and put it through a floating hoop. Each team has a hoop, and points are rewarded for scoring. The points double if you jump through the hoop with the ball. Honestly, it was hilarious each time we played. We also played the standard set of Team Deathmatch, Capture the Flag and, hooray, Hardpoint. 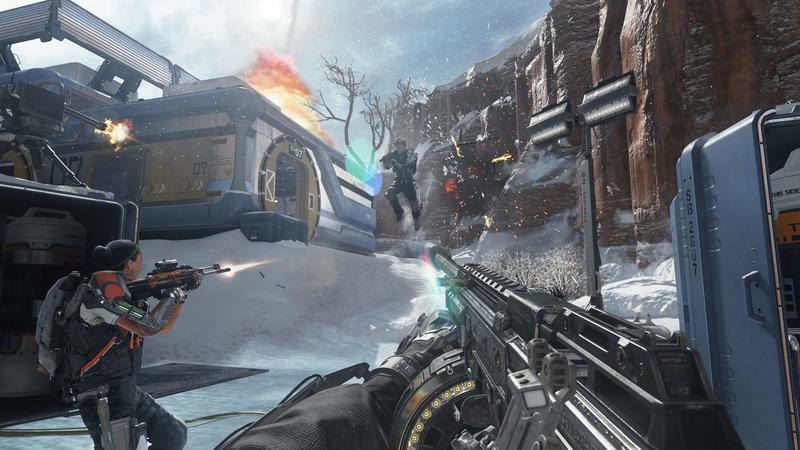 Hardpoint is a capture and hold game that features a constantly changing capture position. It's a good way to force the combat into completely different parts of each map at a strong pace, and that makes it a dynamic and welcome mode that went missing in recent entries. The other new gametype we heard about was Momentum. This is a new take on the War mode from World at War. There are five capture points on the map, but only one of them is active. Once you have that point held, all your kills and future caps are worth a lot more points as the momentum bar grows. Should the enemy grab a new point, the bar will reset. This rewards streaky play, obviously. I'm not sure I've genuinely liked a set of maps from Call of Duty since Black Ops. So far, Advanced Warfare is off to a good start. Over the course of the evening, we played on four announced maps. I'll give you a quick description of each here and now, but the screenshots that litter this post come from all four of them. They were each distinct in look and feel, so that's a big positive. My favorite of the bunch was easily Ascend. The map is the site of a space elevator. It's clean, hard and futuristic. Honestly, it looks like a scene out of Deus Ex: Human Revolution, just without all the gold. Now, the awesome bit about this map beyond its verticality and three lane design? It has a specific scorestreak reward. Kill enough, and the map's defense system turns on and a set of turrets targets your opponents. Then there was Riot, a map I placed in first or second on every single time we played. Fans of Ghosts will tell you that the prison map has already been done, but here it is again. The prison has been bombed out in the center, and you'll fight in the rubble there or along the building's perimeter. I loved using the boost jump here, especially to gain a height advantage on groups duking it out below. I quickly piled enough points up to call in a scorestreak reward that played like Gears of War's Hammer of Dawn. Then came Defender, the map that played host to rounds of Uplink (that's the Quidditch-like game mode). This map sits below the Golden Gate Bridge, and it features the crumbling site of what seems to be a bomb shelter or defense position. Graffiti and urban decay settle in on the locale, and that sets it apart from the similarly color-schemed Riot. The twist here is that a tsunami rolls in during the match, forcing opponents to boost the heck out of the way. Once the water sets, you can actually swim in it. Finally, my least favorite of the preview was Biolab. I liked the map's futuristic snowy setting a lot, but there were way too many choke points for my liking. We were either hurling grenades into the tight yellow tunnel or fighting next to these weird cylindrical things the entire time, either way, the combat felt focused to such a small point on the map that it never really felt diverse. Another group of combatants, though, and that might change. The most telling sign that I actually enjoyed my hands-on time with Call of Duty: Advanced Warfare has to be the lingering excitement that's left. Here I am, putting the finishing touches on this story on Monday morning before publishing, and I'm still sort of bummed that I have Ghosts at home instead of Advanced Warfare. At the potential expense of a good relationship with the makers of Call of Duty, I totally admit that this is a franchise I'd grown tired of and completely given up on. This is me saying I'm excited again. I will likely have a ton of fun with the competitive multiplayer when this game launches on PC, Xbox One, PlayStation 4, Xbox 360 and PlayStation 3 on Nov. 4 of this year. It's different. Isn't that what we've been clamoring for ever since Modern Warfare 3?